Hanuman Chalisa Livestream on Sunday 31.12. Are you coming spontaneously to the Hanuman Chalisa? 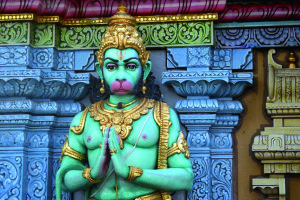 Tomorrow evening (30.12) at 7 pm we start with the introductory seminar about Hanuman. And on Sunday the 31.12. from 10 o’clock in the morning we recite the Hanuman Chalisa 108 times in Sasbachwalden Germany. It is best to subscribe to us, so you will receive a notification as soon as we go live. We are glad, if you leave us a small donation for the livestream, more information here too. We wish you a wonderful Hanuman Chalisa! This entry was posted in Hanuman Chalisa on December 29, 2017 by jennyhumke. Lots of Exciting and Auspicious Events Throughout the Holidays! For the New Year, would you like to raise your vibration and burn away negative karma? Then come to the Hanuman Chalisa and draw powerful, spiritual energy into your soul. A mystical journey full of spiritual energy, transformation process and miracles. Meet authentic yogis and visit rare, special places of power. Ask all your questions! Because, from now on and from time to time, there will be live, spontaneous Satsang taking place on Facebook. Sometimes in German and sometimes in English. Meeting times and dates are announced shortly before. The first video is in English. This entry was posted in Events, Satsang on December 11, 2017 by jennyhumke.